The first Glastonbury Festival was held the day after Jimi Hendrix died in 1970. Glastonbury saw over 140,000 people camping over 900 acres of farm land. An estimated 3 million gallons of water were drunk, 2,500 toilets were used. British singer Lily Allen attended her first Glastonbury aged just five weeks old. LONDON, England (CNN) -- Glastonbury festival held in Somerset, England every year is the world's biggest open air arts and music festival. 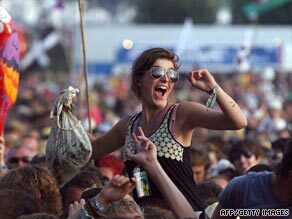 A fan gets into the spirit of the Glastonbury music festival. It attracts around 140,000 music fans who spend between three and five days camping and listening to hundreds of musicians on Worthy Farm. The festival is famed for its mud-fueled mayhem and heavy rain. However, this year revelers managed to escape from the downpours with plenty of sunshine blazing, but with the occasional rain. Among the highlights this year were the newly reformed Brit-pop band Blur, 'The Boss', Bruce Springsteen, dance queen Lady Gaga and The Prodigy among many others. Past performers include rapper Jay-Z, David Bowie, Rod Stewart, Paul McCartney and Shirley Bassey. The festival was started by farmer Michael Eavis in 1970, the day after Jimi Hendrix died. Around 1500 people attended, paying less than two dollars in entry fees including free milk from the farm. Today tickets cost around $240. Each year many of the festival goers stay on an extra day to help volunteer in the cleaning up process which will see more than 1600 tonnes of rubbish removed from the site over the next three weeks. After the clear up, the site will return to a working dairy farm until next May when preparations for Glastonbury 2010 will begin.